Carrefour Poy is a small village on the outskirts of the city of Arcahaie which is about an hour and a half drive north of Port-Au-Prince. 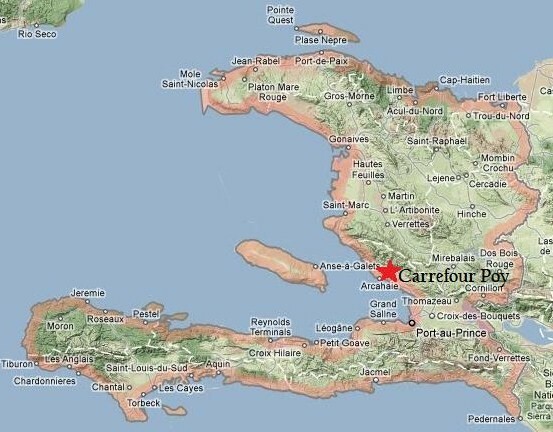 Carrefour Poy, that little suburban of the City of Arcahaie, Haiti, is one of the spots God led to plant an evangelism program. Very soon after planting the church came the need [for] an elementary school that would help children go to school while learning about the salvation provided by Jesus-Christ. [It is a] place where most of the people then worshiped the devil and had a part in Voodoo practices! By the way, the Power of the Holy Spirit, through the church, has reduced the power of evil since we got there. Lots of Christians at the church had Voodoo practices [in their] background. Many of the children of the school are sons/daughters of Voodoo practitioners. Lots of children in Haiti are found in the streets begging, sweeping cars’ windows for living due to financial hardship of the parents. Government can not do it all since the problem is so intense. Are you not proud looking at our children? Should you not thank God who gives you the privilege to make the difference in those children? Thanks for supporting the children! Thanks for reading my post! Enjoy watching our progress.